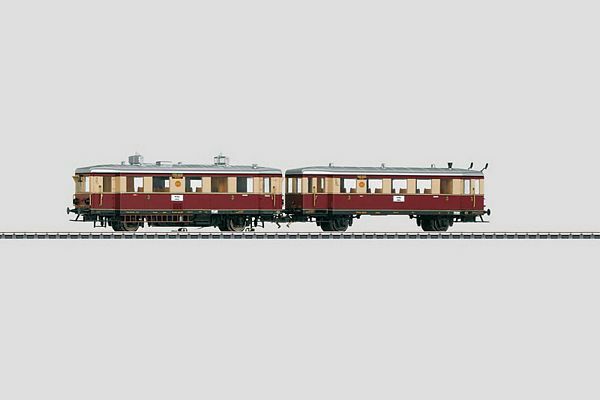 Marklin 37707 Diesel Powered Rail Car with a Trailer. Prototype: German State Railroad Company (DRG) 2-part diesel powered rail car, consisting of a class VT 135 Nürnberg motor car and a class VB 140 Nürnberg trailer car, 3rd class. Wine red / beige basic paint scheme. Engineer's cabs in the motor car include sunscreens and a straight horn at each end of the car. Roof equipment of the motor car includes applied roof air coolers as well as intake and exhaust pipes. Signal brackets with marker signs at one end of the trailer car. Thin design buffers on the motor and trailer car. Road numbers VT 135 009 and VB 140 032. Train route "Nürnberg-Erlangen". The cars look as they did mid to end of the Thirties. Model: The powered rail car has an mfx digital decoder and extensive sound functions. It also has controlled high-efficiency propulsion with a flywheel, mounted in the motor car. Both axles on the motor car are powered. Traction tires. The motor car and trailer car have factory-installed interior lighting. The dual headlights and dual red marker lights on the motor car change over with the direction of travel; they as well as the interior lighting will work in conventional operation and can be controlled digitally. The headlights and interior lighting are maintenance-free warm white LEDs. The headlights / marker lights on the motor car can be turned off separately on End 2 and End 1. As in the prototype, the trailer car has no headlights. Current-conducting couplers are included and can be inserted on both ends as a connection between the motor car and trailer car. The cars have interior details. There is a clear view in the motor car and the trailer car. There are separately applied ladders on the motor car. Length over the buffers for the two-car set 28.1 cm / 11-1/16". mfx decoder with extensive sound functions. Factory-installed interior lighting with warm white LEDs in the motor car and trailer car. Trailer car includes signal brackets and marker signs. Bodies constructed mostly of metal. Road numbers: VT 135 009 und VB 140 032.